EnergyGuard™ Elastomeric Roof Coating is a high solids, acrylic elastomeric coating for all types of roofs. Built Up Roofing (BUR), Concrete Roofs, Masonry, Metal Roofs, Modified Bitumen, Polyurethane Foam, Single Ply Roofing and Wood. Reflects the sun’s UV-rays and prevents premature degradation. Easy to use, non-toxic and VOC compliant water based coating. EnergyGuard™ Elastomeric Roof Coating is available directly from EPDM Coatings like liquid rubber and liquid epdm. Pricing information can be obtained from an EPDM Coatings Representatives. Caution: EnergyGuard™ Elastomeric Roof Coatings is a water-based product which will freeze and become unusable at temperatures below 32°F. Suspend all application if conditions prevent a complete cure before sunset, rain, fog, dew or freezing temperatures. Product must be completely dry before exposing to water or foot traffic. Keep Lexis containers covered when not in use. Dispose of all containers in accordance with state and local environmental regulations. Keep away from children. If ingested, DO NOT induce vomiting. Call Physician immediately. 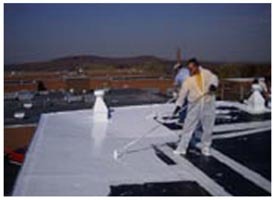 An elastomeric coatings are roofing applied in a viscous state. It has elastic properties, and can stretch in the summer time heat and then return to their original shape without damage. Elastomeric coatings usually contain polymeric materials, such as acrylic, and a white pigment, such as titanium dioxide, to make them opaque and reflective. An elastomeric coating is applied thicker than paint. An elastomeric coating can be used on virtually any substrate including asphalt built-up roofing, concrete roofing, metal roofing, modified bitumen roofing, polyurethane foam roofing and single ply roofing. Common Types: acrylic elastomeric coating, butyl elastomeric coating, silicone elastomeric coating and urethane elastomeric coating. All seams, penetrations, non-structural gaps and parapet walls should be flashed. All fasteners should be sealed or capped with elastomeric caulk. Inspect the roof for defects or flaws. Apply the elastomeric coating to the entire roof surface to produce a seamless, watertight membrane. Save up to 50% compared to re-roofing with little or no disruption. Reflects up to 90% of the heat. Saves money on cooling. Solves roof leaks economically and effectively. Includes a 10 year manufacturer’s warranty when professionally installed. Elastomeric coatings are best applied by high pressure airless sprayers. We recommend a model that has a pressure rating of 3000 psi and a flow rate of 3 gallons per minute. This entry was posted in Elastomeric Roof Coatings, Roof Coatings and tagged EPDM, EPDM Liner, Liquid EPDM, LIquid Roof, Metal Roof Leaks, roof leaks, Roof Maintenance, Roof Repair by webmaster. Bookmark the permalink. We’re a group of volunteers and starting a new scheme in our community. Your website offered us with helpful info to work on. You’ve performed an impressive activity and our entire neighborhood will likely be grateful to you. Thanks a lot for detailing a rich information about the energy guard elastomeric roof coatings so beautifully. I am soon going to have restoration of my roof. Your blog is really great for me at this time.